Have you heard? Natasha Lyonne is slowly being written off Orange is the New Black to headline a show of her own: Russian Doll on Netflix. In fact, the show premiered this week (!!!) and is executive produced by Amy Poehler. So why are we just now hearing about it? The show centers on Natasha Lyonne’s character Nadia, a young woman who can’t stop reliving her 36th birthday. Well...maybe it’s more accurate to say that she keeps dying on her 36th birthday and she just can’t stay dead. And it’s a comedy. 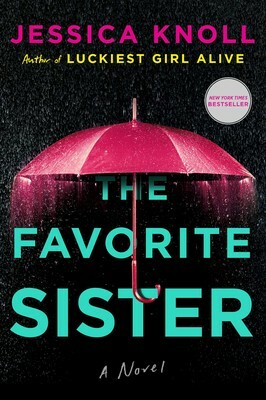 Sharing the real reason we want Natasha Lyonne to star in a movie adaptation of The Favorite Sister would be giving away one of the biggest twists in the whole novel. Lyonne has made a career out of playing queer icons (despite not being queer herself), so it’s only natural that she play Brett -- the titular favorite sister. Brett’s dealing with a newfound reality TV fame, a mode Lyonne will be able to tap into without a second thought. And there’s so much scheming in this book. Who doesn’t love watching Natasha Lyonne think? Madeline Miller’s incredible novel Circe (a literal epic!) is the perfect star vehicle for Natasha Lyonne. The novel centers on the witch/nymph Circe, a character you might remember from your elementary school unit on Greek mythology. Or maybe she sounds so familiar because she showed up (briefly!) in The Odyssey and you keep telling yourself you’re going to reread it -- only all the way through this time. Well, jump on this novel because it’s incredible. This novel explores The Odyssey from Circe’s perspective, and is decidedly light on the Odysseus narrative. (Just the way we like it.) Now imagine Natasha Lyonne as an ageless witch whose story spans literal centuries. Sounds good, right? If you haven’t yet read My Year of Rest and Relaxation, read it with Natasha Lyonne in mind for the lead role. Who doesn’t want to see her play an entirely unlikeable character, one filled with warped perceptions of how the world works? Rather than engage in society, the narrator of this novel decides to just opt out -- for an entire year! She puts herself on a dangerous drug cocktail and locks herself in her apartment, waking only when absolutely necessary. Only she keeps getting out. And the result is something we just can’t look away from. If Natasha Lyonne was at the center of this book’s adaptation, it would be even harder to look away. One of our favorite books of last year was Give Me Your Hand by Megan Abbott, a chilling psychological thriller about women in STEM. The role of Diane -- top of her field and determined to stay that way -- would be perfect for Natasha Lyonne. Just like Diane, she has the capacity to turn on a dime. One minute she’s your friend, the next minute she’s killing someone just to keep a secret. Okay, so maybe that’s just Diane. But we really want to see Natasha Lyonne in a thriller. Don’t you? We fell in love with The Pisces from the very first page, but now that we’re picturing Natasha Lyonne in the role of Lucy, we’re seriously thinking about giving it another read. (We know, we know. So many books, so little time.) But picture this: Natasha Lyonne in love with a merman. Well, not exactly in love. More like obsessed. But truly, who among us wouldn’t be? And while we could daydream about Natasha Lyonne in this role all day, let’s not forget that we suggested Michael B. Jordan play the role of Theo, the merman. How’s that for a perfect pairing?